Photographs by Andrew McRobb, RBG Kew 2008, and others. But, sadly, many of the other pictures were first time revelations. What was I doing? 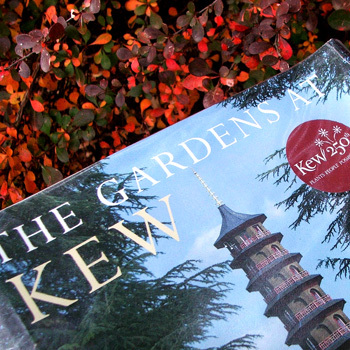 I wandered around Kew for hours, happily snapping, and none of my photographs match those in the book. Mind you, I've concentrated on images of New Zealand Cordylines in urns and Lavender in rows. There's nothing particularly Kew-specific about either. Kew's big anniversary book explains its history well, and the photographer obviously knows the right seasons for the best pictures. And Kew suits a big book - there's lots of big stuff to see at Kew, either inside the giant glass-houses or outside staring down long, hazy vistas. On my next visit I'll take a more disciplined, less colonial approach to Kew. I'll follow the arrows on the map, and tick things off. I will not miss out the Chinese Pagoda. 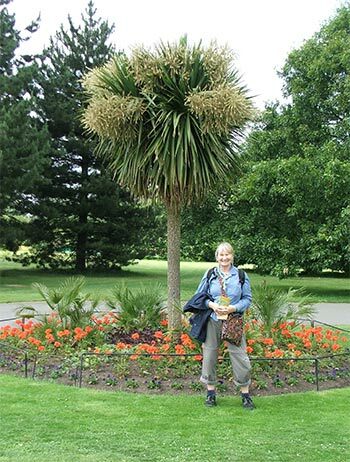 There will be no accosting English gentleman-strangers to take my photograph, beaming, in front of every New Zealand Cabbage Tree. I will forget about me (and the Heathrow-bound jets) and concentrate on the real Kew. It's a great big book, by the way!